Six reasons to do a first look on your wedding day will hopefully convince you that it's the best course of action. 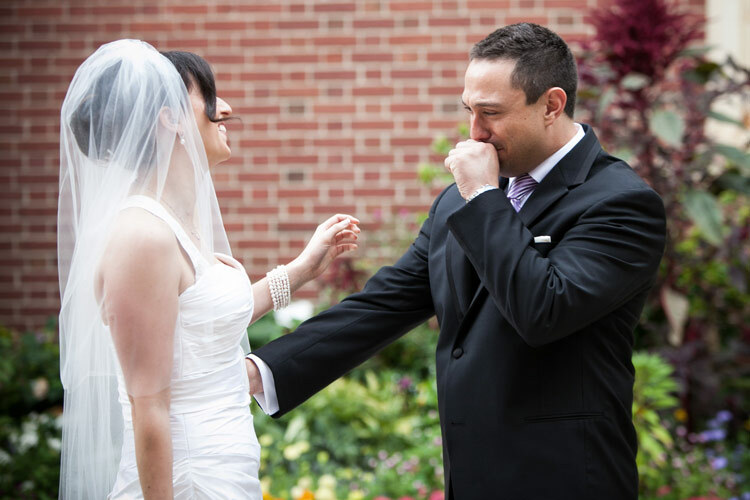 A First Look is when the Bride & Groom see each other before the wedding ceremony. So why do it? Isn't that magical moment, when the bride arrives at the top of the aisle and locks eyes with the groom, what it's all about? Yes, but there's another way. As an experienced wedding photographer, let me give you some insights into why I believe you should absolutely do a First Look. Better wedding photographs. Without a doubt, your wedding photography will be better. Now why would doing a first look result in better wedding photographs? Well, it's all a question of time. Consider a typical wedding day timeline where there is not a First Look. How long is there normally between the end of the ceremony, and your introduction into the reception room? Usually, it's not much more than an hour, the Cocktail Hour. Maybe it's an hour and a half, but it can't much more because you have 200 guests that need to be entertained, and fed. So while your guests enjoy the cocktail hour, unfortunately you can't. You have some other things you have to do first. This part of the day is not always smooth, and I have seen many tears shed at this point. If the time for romantic photographs is painfully short, and the sudden absence of Great Uncle Bob for a family photo causes a delay, guess who feels the pressure? You do. If these family photos take 45 minutes, how much time does that leave you before you are introduced into your reception? You might have just enough time to freshen up! See the problem? You are now ready to start your reception, and you haven't taken a single image romantic with your new spouse. A major stress. You have booked a professional photographer, and yes, your day is being captured, but what about wedding photos you dreamed of? And what about the bridal party photos? So let's get to those Six Reasons To Do A First Look. Seeing each other at the top and bottom of the aisle is a tradition, and some see it as romantic. Personally, I think a properly structured First Look is much, much better. In the aisle scenario, there is a visual connection, but little more. The Bride & Groom stand at the altar, in full view of all of their guests, and the ceremony begins. Eventually, there is a kiss - the first physical interaction. Let's contrast that with an arranged First Look. Firstly, the scene is chosen. It's a romantic setting, and there are no guests. It's a very private moment. The groom, on seeing his bride, is free to gasp, be visibly impressed, shed a tear even. He can stand back and take in the full beauty of his bride. There can be a romantic embrace, a kiss, many kisses! You can stand together, holding each other close, gazing into each others eyes. Maybe there can even be a dip. Now, imagine for a moment the awesome photographs that can come from this scene. Your photographer is free to move around, to get the best angles, without restriction. This is massively different from a ceremony shoot, especially a church ceremony. Let's look at reason number 2. Photographing a First Look allows for the most important ingredient to be added to the mix, subjects aside. Daylight. Images photographed in daylight will be infinitely better than images shot indoors under tungsten lighting. Regular tungsten lightbulbs are what gives that horrible orange coloring to photographs. When it comes to churches, not only is it orange light, it's usually low orange light. Churches are mostly on the darker side. A beautifully lit scene is the goal, always. Seeing each other for a First Look means more time together! Yes, rather than avoiding each other all day long, you can spend the day together, having fun. Isn't that a better way to spend your wedding day? For those ceremonies later in the day, not seeing each other earlier might mean that 70-80% of your wedding day, will be sent apart. Actively avoiding each other in fact. Hmm, seems like a weird plan to me. So why not do a First Look, spend as much time as possible together, and maximize your wedding day fun! It's a high pressure day, a day that has sometimes been dreamed of since childhood. The planning process takes a lot of work too. That can be a little stressful. So being able to hold the hand of your intended, throughout the entire wedding day, can really take the pressure off. You are facing the day together, and it will make a lot of difference to how you feel. Not only better wedding photographs, but more of them. 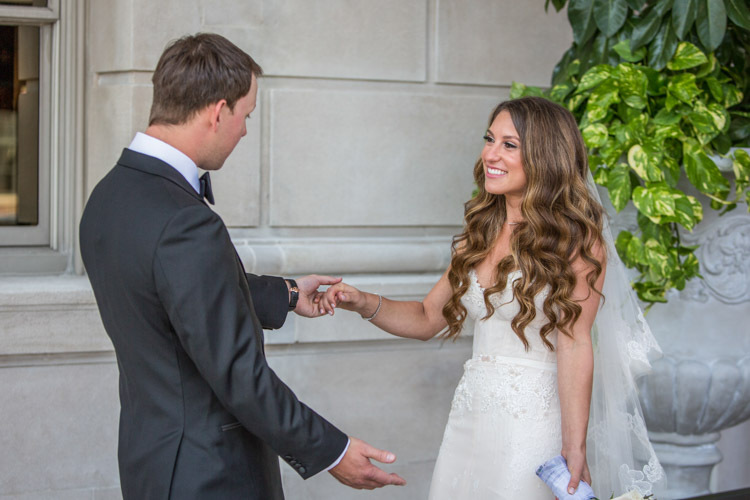 Seeing each other before your ceremony allows you to better plan your day. There can be lots of time for shots with your bridal party, and of course you can focus on those cool romantic Bride & Groom images. And when it comes to the family photos, if someone goes missing at a crucial time, it wont cause nearly as much stress. Why? Because all of the other important photographs will already be in the bag. 6. Enjoying Your Own Wedding! See each other earlier in the day at your First Look, spend some time together, make sure all your family and romantic images are taken, and attend your cocktail hour. It's your day, make the most of it! A First Look will give you all the time you need. That Cocktail Hour is calling - enjoy! So there we have it, six reasons to do a First Look. It will give you much more time to enjoy your wedding day, take away lots of stress, and give you better photographs. It's a win win.